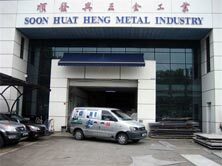 Soon Huat Heng Metal Industry started her business in the 1980s. We were then located at Penhas Road where we first started out as an oxygen acetylene cutting service company. As the industry evolved, our company also engaged in plasma cutting services. Our company grew and we decided to further diversify our business where we subsequently moved to Ang Mo Kio Industrial Park. We started welding consumables supplies in the 1990s. We first brought in a Taiwanese brand Kuang Tai Metal Industries as our welding electrodes manufacturer. Later we were awarded as the sole agent for AvestaWelding welding consumables in Singapore. We also began to supply welding, plasma cutting and portable gas cutting machines. Our technical department had tested out a couple of brands in the market and decided to concentrate on a few brands, inclusive of HeroPower Technology and Wel & Cut. Due to the lack of factory space for our expanding business, we shifted from Ang Mo Kio Industrial Park to our present location, Jurong Industrial Estate, Joo Koon Circle in the year 2002. As we stepped into the new millennium, our company decided to concentrate and venture into a new form of cutting services; high pressure waterjet cutting. Waterjet cutting allowed us to provide our customers with a better edge quality finish cutting. Oxygen acetylene cutting and plasma cutting services were slowly phrased out from our business focus. We subsequently brought in two waterjet machines to cope with the ever increasing demand of high quality finish cutting.